I was in Scotland very recently, on a family holiday, and noticed the large number of churches in cities, towns, villages and fields. The two most common denominations represented were the Church of Scotland and the Episcopal Church of Scotland – we were in the Lowlands. Few, regardless of location, offered more than a morning service; some offered two different services, Holy Communion and Sung Eucharist, as the alternatives for each morning. It is hard to think that much preaching takes place. Alongside the very visible presence of church buildings, the general worldliness of people was striking. We happened to be in Edinburgh on the first day of the Festival. There was hardly room to breathe. Of course, most of those attending were not Scottish, judging by the English, North American and various European accents. 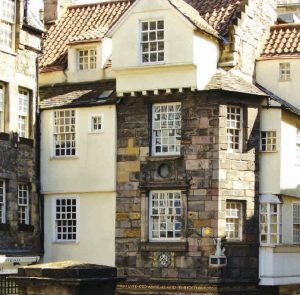 Every establishment seemed to be packed to the doors, except John Knox’s house – also a Festival venue. Several Edinburgh churches carried notices indicating that they were venues for the Festival. I cannot speak for what would take place there, although a recent weekday visitor to my church in Reading told me he was taking an act, reminiscent of pantomime, to the Festival, and invited me to the church where it was being held. I did not take him up on his offer. This seems to be an unnatural contrast. On the one hand, church buildings are so common that they testify to the presence of Christianity in our land for very many centuries. Those who know their history know that Christianity can be traced back at least to the Roman martyr Alban in AD 150. On the other hand, the population of our land seems untouched by Christianity – and Scotland is by no means the only part where this is true. What English town or village does not have one or more church or chapel buildings? What Welsh village is without its chapels, often representing different denominations? I have never been to Ireland, so cannot speak for the scene there, but do not imagine it to be much different – Belfast Anglican cathedral has just appointed a Roman Catholic priest as canon. How many of these churches and chapels are open more than once a month? What, therefore, constitutes visible Christianity in our nation? The answer, sadly, is the version portrayed in the media, Rome or the Church of England. Neither of these is a safe guide, the former for reasons that are too obvious to mention, and the latter because, in spite of her formularies, her leaders are in thrall to a form of theology which would be unrecognizable to the Reformers. This points us to the reason why the Church makes so little impression on society. Many churches think they are making an impression. They are motivated by social concerns, and expend much energy helping people in their present needs. The impression they make, however, is not long-lived. If a person’s greatest need is water, and water is supplied, the next item on the list becomes the greatest need, whether it is food, or medical care, or some other matter. The list is almost endless. The difference we need to make is the one that is eternal. We need to preach Christ, and him crucified, to a lost and perishing world. We need to do so with a sense of urgency, warning people to flee from the wrath to come. We need to do so with love, knowing we have been saved from our own sins, and, but for the grace of God, would be as lost as those to whom we preach. At this point I imagine many will be saying that they are not preachers. Indeed. However, I imagine we all know the derivation of the word ‘martyr’, as one who bears witness. It is surely the duty of all Christ’s people to bear witness every day to the grace of God in Christ Jesus, to the regenerating work of the Holy Spirit, and to the washing of the Word. Our refusal to participate in worldly activities, our desire to show our love for Christ through holy living, and our edifying conversation, are all forms of bearing witness. When Christians do this, they become the Church Visible, and are no longer the Church Invisible – silent, secret and unnoticed. The world has a way of getting itself noticed, with protests, strikes, great celebrations of its own petty achievements, and so on. Much of what calls itself the Church imitates the world, and so gains the attention it desires. The effect, sadly, is not the glorifying of Christ, whose name is never reported in connection with such thing. The need for visible, audible Christianity has never been greater. Sinfulness, of the most open and wicked sort, abounds in our land. The moral degeneracy of our society has made it a prime target for the violence and hatred of those who believe they stand on the moral high ground. We have seen the way our European neighbours have been made to suffer through various atrocities, and it is only a matter of time before we feel more of the same here. Such acts are, ultimately, in the will of the God of heaven, whose justice reaches to all. Will any dare to say that we, as a nation, deserve less than others have received? Have we not, as a society, turned our backs on generations of blessing from the Lord? Have we not delighted to deafen our ears to the gospel, and to live as though there is nothing beyond the grave? The failure of the churches to speak out against such things, or to teach our members the vital necessity of faithful Christian living, must surely bring the judgment of God upon us. Had the Protestant Reformers shared the attitude of too many professing Christians today, it is hard to think that we would have every heard of them. Had the missionaries in the eighteenth and nineteenth centuries, to lands and cultures entirely hostile to the gospel, shared this attitude, one cannot even imagine them boarding ship, never mind spending their lives for the cause of Christ. Let us learn from such.